Saxony-Anhalt (German: Sachsen-Anha), is a landlocked state of Germany. 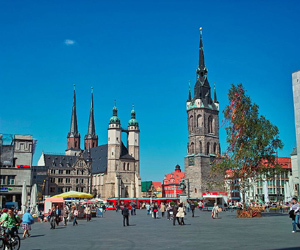 Its capital is Magdeburg and it is surrounded by the German states of Lower Saxony, Brandenburg, Saxony, and Thuringia. Saxony-Anhalt is one of 16 states of Germany. It is located in the western part of eastern Germany. By size, it is the 8th largest state in Germany, and by population, the 10th largest. Saxony-Anhalt covers an area of 20,447.7 square kilometres (7,894.9 sq mi).It has a population of 2.34 million (more than 2.8 million in 1990). Saxony-Anhalt should not be confused with Saxony or Lower Saxony, also German states. 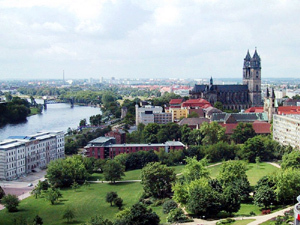 The capital of Saxony-Anhalt is Magdeburg. It is the second largest city in the state, head-to-head with Halle. I n the north, Saxony-Anhalt is dominated by plain. In the sparsely populated Altmark, old Hanseatic cities like Salzwedel, Gardelegen, Stendal, or Tangermünde are located. The transition from the Altmark region to the Elbe-Börde-Heath region with its fertile, sparsely wooded Magdeburg Börde is accomplished by the Colbitz-Letzlingen Heath and the Drömling near Wolfsburg. 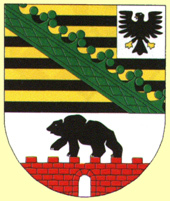 In the Magdeburg Börde you can find the cities of Haldensleben, Oschersleben (Bode), Wanzleben, Schönebeck (Elbe), Aschersleben, and Magdeburg, from which the region derives its name. n the south-west, the Harz mountains are located, comprising the Harz National Park, the Harz foreland and the Mansfeld Land. The highest mountain in the vicinity is Brocken, with an elevation of 1,141 meters (3,735 ft), which at the same time is the highest elevation in northern Germany. In this area, one can find the cities of Halberstadt, Wernigerode, Thale, Eisleben, or Quedlinburg.